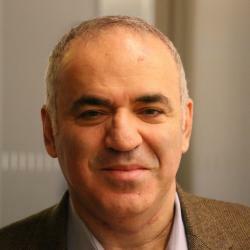 Garry Kasparov is a Russian chess Grandmaster and former World Chess Champion, considered by many to be the greatest chess player of all time. In addition to holding the top spot in FIDE’s world rankings for 225 out of 228 months from 1986 to 2005, during that time Kasparov also won 15 consecutive professional tournaments and 11 straight Chess Oscars (both achievements unbroken records to date). When he lost to the IBM Super-Computer Deep Blue Junior (the rematch) in a highly publicized match of 1997, he became the first World Champion to lose a match to a computer under standard time controls. Garry Kasparov was the most dominant World Chess Champion in history, winning his first world title in 1985 at the record-breaking young age of 22. For nearly 20 years he dominated the competition, holding on to the #1 world ranking and achieving the highest peak FIDE rating ever of 2851 (recently broken by Magnus Carlsen). A true ambassador for the game, Kasparov is well known outside of the chess community for his matches against IBM Super-Computer Deep Blue and Deep Blue Junior, as well as writings on politics and business. Kasparov announced his retirement from professional chess on March 10, 2005 so that he could devote more time to politics and writing. Since then, he has authored what is widely considered one of the best works of modern chess literature with his “My Great Predecessors” series. 1st part of "My Great Predecessors"